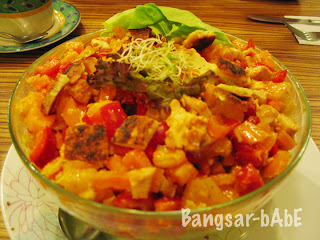 I recently had dinner with Tgin at Marmalade, Bangsar Village. I ordered the Sounds of Havana (full). Tgin had the Spaghetti Smoked Salmon and Soup of The Day – Pumpkin Soup. The salad was DELICIOUS. The combination of pineapple, bell pepper, cashew nuts & haloumi and chicken cubes was simply scrumptious! It came topped with cheese bits and alfalfa sprouts. 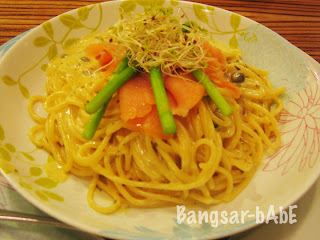 Tgin’s Spaghetti Smoked Salmon was pretty good. Coated with cream sauce, herbs and topped with smoked salmon, it was good stuff. The salmon complimented the creamy white sauce beautifully. The pumpkin soup was sweet and creamy. The texture was quite thick, making it taste slightly like a puree. 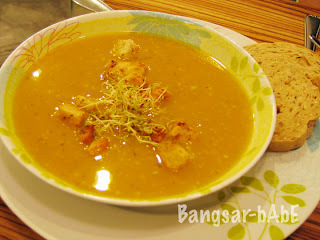 The soup came with a slice of bread and garnished with croutons and their signature alfalfa sprouts. We ended dinner with the usual carrot cake. Lucky thing they don’t put alfalfa on top of their cakes…kekeke. 🙂 I’ve blogged about the carrot cake during my previous visit so I won’t elaborate on this. Verdict: One of my favourite places to relax…need I say more?